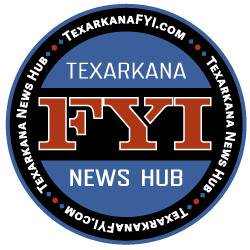 Texarkana Biker Clubs are many times the very first to step up to help folks in need and pitch in on so many community projects. 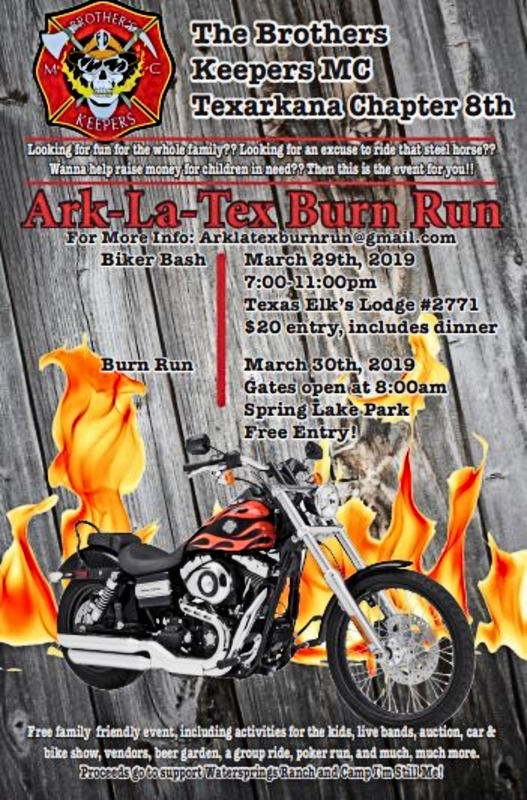 From our local Pink Ride, to Bikers Against Child Abuse, and now we have the first annual “Ark-La-Tex Burn Run” in Texarkana on March 29, and 30, 2019 hosted by our local chapter of The Brothers Keepers Motorcycle Club. Mark your calendars, on Friday, March 29 it’s the Biker Bash from 7:00 pm to 11:00 pm at the Elks Lodge #2771. $20.00 entry gets you good food, music, auction, and great company to gear up for Saturday’s main event at Spring Lake Park. Saturday, March 30 at spring lake park is an organized ride, a poker run, kids area, vendors, live music, beer garden, auction, car and bike show, and so much more. Come out and have a great time while helping us to raise money for the amazing kids at WaterSprings Ranch and Camp I’m Still Me!! BKMC 8th is located Texarkana, Texas, and is among 36 BKMC chapters that span across the U.S., Canada, and Australia. We are a group of retired and active firefighters, EMT and paramedics, along with supportive families, who have dedicated not only their lives to helping others but a club dedicated to helping children in our area. We participate in several charities including Toys For Tots and assist and support our fellow chapter’s events and fundraising efforts as well but two of the main organizations we support are Watersprings Ranch in Texarkana, Arkansas, and Camp I’m Still Me in Scottsville, Texas. Watersprings Ranch is a privately owned safe haven for children that have been abused, neglected or unwanted. It is a non-government funded home ran by a wonderful group of people who have dedicated their lives to providing for these children and even sending them to college, if they so choose. In December 2018, BKMC along with several other motorcycle clubs in the Texarkana area gathered together at Watersprings Ranch and provided food, household items, clothing, money, Christmas presents, and motorcycle rides for 30 children. Camp I’m Still Me is a summer camp dedicated to children who are burn survivors. These children are able to go to camp without stares, ridicule, or judgement…and are able to attend completely FREE! Just this past June 2018, the combined efforts of several BKMC chapters presented Camp I’m Still Me with a check for $92,000! 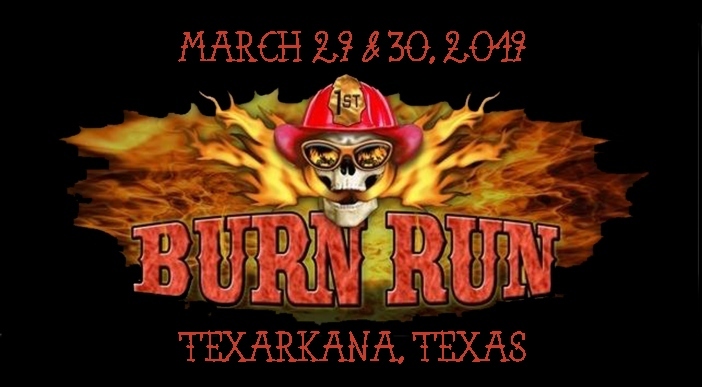 This year, we are kicking off 2019 with the 1st Annual ArkLaTex Burn Run in March at Spring Lake Park. This is a 2-day event with all proceeds going to the benefit of children. This even will be a resounding success…with a little help from our friends. As our BKMC chapter continues to grow, so does our dedication. We invite you to be a vital part of helping to change a child’s life.